ZION NATIONAL PARK – Helicopter rides above Zion National Park are popular among tourists, but on Monday and Thursday, the helicopters will be performing a different type of aerial operation, something park employees affectionately call “Helipoo Day.” The handling of waste from toilets at Scout Lookout on the Angels Landing trail will cause temporary trail and road closures in the park Monday and Thursday. The toilets have to be emptied by hand, and since they are on a lookout that is 1,000 feet in elevation, it can only be done once a year – by air. To accomplish this task, the park will briefly close Scout Lookout and access to Angels Landing Monday between the hours of 7 a.m. and 1 p.m.
To protect the public and park staff, road closures will also be in place Monday periodically between the hours of 10 a.m. and noon. Flaggers will be placed on Zion Canyon Scenic Parkway to close the roadway at various intervals while these aerial operations are taking place. Park officials estimate that between 10 and 15 of the 500-pound drum barrels will be hauled each day and later be replaced after the barrels are emptied by the waste removal company. Managers said the trail that leads up to Scout Lookout has grown in popularity, but the restroom facilities up at the top remain the same. And they’re not equipped to handle that increase in tourists. The evaporative toilets that are designed for 50 visitors a day are now being used 400 times per day, and this creates quite a challenge for park management, according to a press statement from Zion National Park. Visitors have been asked to use the restrooms located at the Grotto parking and shuttle stop area before they start hiking up to Scout Lookout. 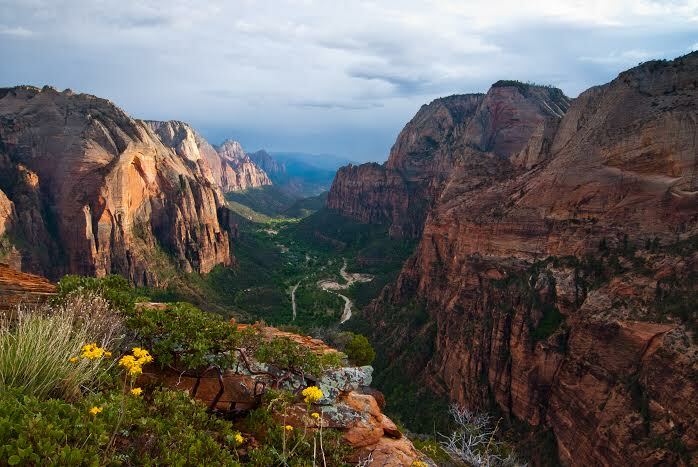 Zion National Park is not alone in the issue of overcrowding. Visitation has been on the rise at virtually every national park in the U.S. the past few years, according to a February report from St. George News. The Angels Landing Trail is one of the most famous in the national parks system and was listed as No. 4 in National Geographics “Top 10 Best of Everything: National Parks” in 2011. In addition to Monday’s closures, the trail will close once more between the hours of 7 a.m. and 1 p.m. Thursday, when the helicopter comes back to bring the full barrels back down. The same traffic closures on Zion Canyon Scenic Drive will be in effect Thursday as were in place Monday. You shouldn’t report things you don’t know to be true. Commercial helicopter rides above Zion National Park are NOT common. Helicopters are not allowed to fly over the park, but only nearby, outside the boundaries. At least one flightseeing company is allowed to fly planes over the park, mostly over wilderness areas.